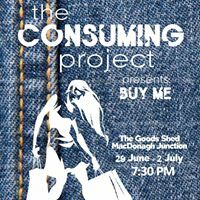 The Consuming Project in association with Rigout Productions and Open Circle Arts in County Kilkenny have developed and presented BUY ME. BUY ME is a multidisciplinary theatre presentation that looks at our relationship with fashion. It explores the issue of ethical clothing and the environmental impact of mass consumption. This performance was the product of a community collaboration between artists and participants, exploring our relationship with fashion through textile and discussion based workshops with Ita Morrissey and Dee Harte. Workshops with women to discuss patterns of consumption, how people feel about clothing and what relationships and behaviours are evident. Engaging with the performers about the message and narratives that would best explore these issues in an artistic and coherent way, whereby the audience would be both entertained and informed. Finally the piece, BUY ME, was rehearsed and performed. The work was devised with professional performers and a musican (Éadaoin Breathnach) and is an innovative and effective way of exploring how society looks at materials and their consumption, textiles and clothing in particular. Open Circle Arts – The Consuming Project – Buy Me from Old Mill Pictures on Vimeo.